Objectives: A simple clinical score (ABCD2 score) has been introduced to triage TIA patients with a high early risk of stroke. External validation studies have yielded inconsistent results regarding the predictive ability of the ABCD2 score. We aimed to prospectively validate the former score in a multicenter case series study. Methods: We prospectively calculated the ABCD2 score (age [≥60 years: 1 point]; blood pressure [systolic >140 mm Hg or diastolic >90 mm Hg: 1[; clinical features [unilateral weakness: 2, speech disturbance without weakness: 1, other symptom: 0]; duration of symptoms [ <10 minutes: 0, 10–59 minutes: 1, ≥60 minutes: 2]; diabetes mellitus [yes: 1]) in consecutive TIA patients hospitalized in 3 tertiary care neurology departments across 2 different racial populations (white and Asian). Results: The 7-day and 90-day risks of stroke in the present case series (n = 148) were 8% (95% CI 4%–12%) and 16% (95% CI 10%–22%). The ABCD2 score accurately discriminated between TIA patients with high 7-day (c statistic 0.72, 95% CI 0.57–0.88) and 90-day (c statistic 0.75, 95% CI 0.65–0.86) risks of stroke. The 90-day risk of stroke was 7-fold higher in patients with an ABCD2 score >3 points (28%, 95% CI 18%–38%) than in patients with an ABCD2 score ≤3 points (4%, 95% CI 0%–9%). After adjustment for stroke risk factors, race, history of previous TIA, medication use before the index TIA and secondary prevention treatment strategies, an ABCD2 score of >2 was associated with a nearly 5-fold greater 90-day risk of stroke (hazard ratio 4.65, 95% CI 1.04–20.84, p = 0.045). Conclusion: Our findings externally validate the usefulness of the ABCD2 score in triaging TIA patients with a high risk of early stroke in a multiethnic sample of hospitalized patients. The present data support current guidelines endorsing the immediate hospitalization of patients with an ABCD2 score >2. However, after excluding the original derivation/validation studies of the ABCD system using data from the same 2 TIA registries (California and Oxfordshire),2,3 multiple external validation studies have yielded inconsistent results,6–18 ranging from excellent predictive ability18 to little better than chance.6 In view of these considerations, we aimed to prospectively validate the former score in an independent, multiethnic sample of hospitalized TIA patients. Moreover, because it is currently recommended that patients with low ABCD2 scores (≤3 or ≤2) should be triaged for nonspecialist care or less urgent specialist care (up to 1 week),5 we sought to determine the early risk of stroke in this specific subgroup of patients. We prospectively calculated the ABCD2 score (age [≥60 years: 1 point]; blood pressure [systolic >140 mm Hg or diastolic >90 mmHg: 1]; clinical features [unilateral weakness: 2, speech disturbance without weakness: 1, other symptom: 0]; duration of symptoms [<10 minutes: 0, 10–59 minutes: 1, ≥60 minutes: 2]; diabetes mellitus [yes: 1])3 in consecutive TIA patients hospitalized in 3 tertiary care neurology departments (Alexandroupolis, Western Sector of Athens, and Western Sector of Singapore) across 2 different populations (white and Asian) over a 1-year period (August 2008 to August 2009). All 3 neurology departments covered population areas where TIA patients were also hospitalized by departments of internal medicine, whereas in the areas of 2 of the 3 centers (Athens and Singapore) TIA patients were also hospitalized in neurology departments of other local hospitals. STARD = Standards for the Reporting of Diagnostic Accuracy Studies. All TIA patients were followed up prospectively at the outpatient stroke clinics of our institutions and clinically reevaluated at 3 months after TIA symptom onset by an attending neurologist. The outcome events of interest were subsequent strokes, defined as cerebrovascular events of sudden onset, lasting for more than 24 hours, clearly resulting in an increase of an existing or in a new neurologic deficit.9 They were determined after evaluation of all the available information obtained from our and other hospital records, physicians' notes in private practice, necropsy findings or death certificates, and the patients' clinical presentation at the regular follow-up assessments. Brain imaging visualizing a new lesion involving an anatomical site or vascular territory that was unaffected on the admission CT scan was mandatory to support the diagnosis of subsequent stroke in TIA patients. The networks of the 3 participating centers were tight in following up the hospitalized TIA patients. More specifically, if patients missed their regular follow-up assessments, they were contacted by telephone and were asked to visit the outpatient clinic with a new appointment. The follow-up evaluation was performed in all 3 centers by attending neurologists who were blinded to the initial ABCD2 score. In addition, all patients were specifically asked in their follow-up evaluation whether they had presented to another local hospital during the past 3-month period with recurrent stroke symptoms to avoid missing any outcome events. The present study was approved the ethics committees of the 3 institutions, and informed consent was obtained from all patients (or guardians of patients) participating in the study. TIA patients were stratified into 3 groups according to their ABCD2 score: low risk (0–3), moderate risk (4–5), and high risk (6–7).3 Moreover, we used the recommended cutoff of 3 points to dichotomize our population to 2 groups: low risk (0–2) and moderate and high risk (3–7).4 The Kaplan-Meier product-limit method was used to estimate the cumulative probability of subsequent stroke after 7 and 90 days from the index TIA. Differences in stroke-free survival between groups stratified by the ABCD2 score were assessed for statistical significance with the log-rank test. Sensitivities and specificities of prediction were determined at each cutoff of the score, and the receiver operating characteristic curve was plotted. Areas under receiver-operator curves (c statistics) and corresponding 95% CIs were calculated as a measure of predictive ability. Cox proportional hazards regression modeling was used to detect factors that increased the risk of subsequent stroke after a TIA. Associations are presented as hazard ratio (HR) with 95% CI. SPSS (SPSS Inc., Chicago, IL; version 13.0 for Windows) was used for statistical analyses. Baseline characteristics of the study population (n = 148; mean age 60 ± 14 years; 59% white, 41% Asian) are shown in table 1. Of the 61 Asian patients, 49 were Chinese, 9 were Malaysian, and the remaining 3 were Indian. No patient was lost during the 90-day follow-up period. The 7- and 90-day risks of stroke were 8% (95% CI 4%–12%, n = 12) and 16% (95% CI 10%–22%, n = 24). All 24 stroke cases were confirmed by brain CT or MRI. During the follow-up period, only 1 death occurred. The cause of death was transtentorial herniation caused by malignant middle cerebral artery infarction (confirmed by brain CT), and in this case no autopsy was performed. The 7- and 90-day risks of stroke in TIA patients stratified according the ABCD2 scores are presented in table 2. Increasing ABCD2 scores had higher predictive values of the 7- and 90-day risks of stroke (p for linear trend across the ABCD2 score levels: 0.0077 for the 7-day risk and <0.0001 for the 90-day risk). The ABCD2 score accurately discriminated TIA patients with a high 7-day (c statistic 0.72, 95% CI 0.57–0.88) and 90-day (c statistic 0.75, 95% CI 0.65–0.86) risk of stroke. The ABCDI score had a similar diagnostic accuracy to the ABCD2 score in discriminating TIA patients with a high 90-day risk of stroke (c statistic 0.79, 95% CI 0.68–0.89). After patients were stratified into 3 groups (low, moderate, and high risk), the ABCD2 score was highly predictive of the 90-day risk of stroke (figure 2): 4% (95% CI 0%–9%) in the group with 0 to 2 points, 21% (95% CI 10%–33%) in the group with 4 to 5 points, and 43% (95% CI 22%–64%) in the group with 6 to 7 points (log-rank test = 20.27, df = 2, p < 0.0001). The 90-day risk of stroke was higher in patients with an ABCD2 score higher than 2 points (21% [95% CI 13%–29%] vs 4% [95% CI 0%–10%] in patients with ABCD2 score of 2 points or lower; p = 0.012 by log-rank test). Also, the 90-day risk of stroke was 7-fold higher in patients with an ABCD2 score higher than 3 points (28%, 95% CI 18%–38%) than in patients with an ABCD2 score of 3 points or lower (4%, 95% CI 0%–9%). Because different guidelines advocate dichotomizing the ABCD2 score using different cutoffs (0–2 vs 3–7 or 0–3 vs 4–7), we evaluated the diagnostic accuracy of these cutoffs in our study sample (table 3). The overall accuracy of ABCD2 score was higher when a cutoff of 3 was used for dichotomization (60%, 95% CI 52%–68%) when compared with a cutoff of 2 (44%, 95% CI 36%–52%). Low risk: ABCD2 = 0–3; moderate risk: ABCD2 = 4–5; high risk: ABCD2 = 6–7. After adjustment for stroke risk factors, race (white vs Asian), history of previous TIA, medication use before the index TIA, and secondary prevention treatment strategies, an ABCD2 score >2 was associated with a nearly 5-fold greater 90-day risk of stroke (HR 4.65, 95% CI 1.04–20.84, p = 0.045). In addition, we repeated our analyses after dichotomizing TIA patients in 2 groups using a cutoff of 3 points (0–3 points vs 4–7). 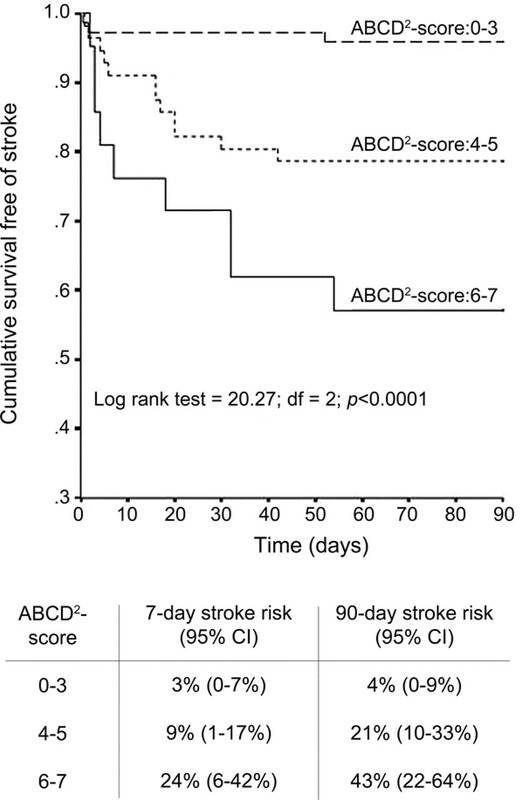 After adjustment for potential confounders, an ABCD2 score >3 was related to a 6-fold higher 90-day risk of stroke (HR 6.36, 95% CI 1.82–22.22, p = 0.004). Recent external validation studies have reported conflicting results with regard to the predictive value of the ABCD2 score.6–18 Certain reports documented limited or insignificant predictive ability of the score,6,7,15,17 whereas others showed satisfactory or excellent external validity.9,13,16,18 The extremely varied methodology in the different validation studies may contribute to these divergent findings, including limited number of outcome events (as low as 2 in one study),6 retrospective data collection by notes review,8,9,12,14 and lack of follow-up after the first 7 days.8,12 Moreover, the clinical specialty of the initial evaluation (neurologists6,7,9–13,15-18 vs emergency department physicians8,14) may account for these discrepant results, because expertise in diagnosing TIA may vary across specialties. In addition, lack of baseline neuroimaging data (CT scan or MRI)14,17 that have been shown to exclude certain TIA mimics4 may also contribute to inconsistent results across studies. Finally, reporting single-center experience may reflect personal bias of the investigator on the predictive ability of ABCD2 score, especially when data are collected retrospectively. We attempted to overcome these potential methodologic shortcomings by conducting a prospective, multicenter study where the initial clinical assessment was performed by neurologists and was coupled by a negative CT scan in all TIA patients. Moreover, all outcome events were confirmed by neuroimaging or autopsy studies, whereas the 3-month follow-up assessments were completed in all cases. Our findings lend support to current guidelines highlighting the high risk of early stroke after a TIA1,20–22 and endorsing the immediate hospitalization of patients with moderate to high ABCD2 scores.4,5 These results may have certain clinical implications because close observation during hospitalization has the potential to allow more rapid and frequent administration of tissue plasminogen activator (tPA), should a stroke occur.4 Indeed, this was the case in 3 patients from the Asian cohort who were treated with tPA during hospitalization. Another benefit of immediate hospitalization is related to cardiac monitoring rapid vessel imaging and higher rates of adherence to secondary prevention mechanism-specific interventions including carotid endarterectomy.4,5 Interestingly, a cost-utility analysis has shown that hospitalization was cost-effective for patients with a high early risk of stroke.23 However, it should be taken into account that no randomized trial has evaluated the benefit of hospitalization using the ABCD2 score to triage TIA patients. Finally, it should be noted that patients with low ABCD2 scores (0–2) are not stroke free and sustain a small risk of 90-day stroke (4%). Therefore, even if these patients are not hospitalized, they should undergo a full diagnostic workup at a TIA outpatient clinic within the first few days after TIA onset. Certain methodologic limitations of the present report need to be addressed. First, there is mounting evidence indicating that TIA patients with diffusion-weighted imaging ischemic lesions on MRI are at substantially higher risk of stroke than those without.4,12 Because diffusion-weighted brain MRI was available in a limited number of patients in our cohort (12%), this potential confounder was not included in the multivariable Cox regression model. Second, given that we evaluated only hospitalized patients, it should be acknowledged that the present study validated the ABCD2 score in a different cohort of patients from those for whom the model was intended to be used (outpatient setting to predict risk for all TIA patients). Moreover, because in 2 of 3 institutions (Athens and Alexandroupolis) patients presenting with transient symptoms of vertigo or dizziness were primarily evaluated by otorhinolaryngologists and not neurologists, posterior circulation TIAs may be underrepresented in the present sample. Third, potential differences in secondary prevention strategies across different centers may have confounded the reported associations between ABCD2 scores and early risk of recurrent stroke. Nevertheless, it should be noted that the reported relationships persisted even after adjustment for secondary preventions strategies and race (Asian vs white) in our multivariate models. Fourth, diagnosis of TIA was made by an attending neurologist. However, the ABCD2 score was developed for use by nonneurologists. Therefore, this cohort is likely somewhat more biased against inclusion of TIA mimics. This could substantially alter the performance of the score and should be acknowledged as a potential shortcoming of the present study. In addition, patients who presented to hospital with a stroke but had a preceding TIA within 7 or 90 days for which they did not seek medical attention were not included in the present cohort, and this may have led to risk underestimation. Finally, because older TIA patients in the areas covered by our institutions may be admitted to the internal medicine department, octogenarians may be underrepresented in the present cohort (7 of the 148 cases, 5%), and this potential bias needs to be taken into account in the interpretation of the study findings, Fifth and most important, the reported association between a higher ABCD2 score and an increased 90-day stroke risk in the present cohort was documented in a relatively small sample size (n = 148), and therefore a type I error cannot be excluded. This is the reason why we documented an extremely high (57%) stroke rate in the group with an ABCD2 score of 7. We assume that this stroke rate is related to the limited number of patients in this specific ABCD2 group (n = 7) and does not reflect the true risk of stroke in this TIA category as shown by the wide 95% CI ranging from 20% to 94%. Dr. Tsivgoulis, Dr. Stamboulis, Dr. Sharma, Dr. Heliopoulos, Dr. Voumvourakis, Dr. Teoh, Dr. Patousi, Dr. Andrikopoulou, Dr. Lim, Dr. Stilou Dr. Sim, and Dr. Chan report no disclosures. Dr. Stefanis serves on the editorial boards of the Journal of Neuroscience and the Journal of Biological Chemistry; receives royalties from the publication of Merritt's Textbook of Neurology (Elsevier B.V., 2009) and Encyclopedia of Movement Disorders (Elsevier B.V., 2010); and receives research support from the Hellenic General Secretariat of Research and Technology, the Hellenic Ministry of Health, the European Union, and the Michael J. Fox Foundation. Dr. Vadikolias and Dr. Piperidou report no disclosures. Received December 1, 2009. Accepted in final form February 9, 2010. Johnston SC, Gress DR, Browner WS, Sidney S. Short-term prognosis after emergency department diagnosis of TIA. JAMA 2000;284:2901–2906. Rothwell PM, Giles MF, Flossmann E, et al. A simple score (ABCD) to identify individuals at high early risk of stroke after transient ischaemic attack. Lancet 2005;366:29–36. Johnston SC, Rothwell PM, Nguyen-Huynh MN, et al. Validation and refinement of scores to predict very early stroke risk after transient ischaemic attack. Lancet 2007;369:283–292. Easton JD, Saver JL, Albers GW, Alberts MJ, et al. Definition and evaluation of transient ischemic attack: a scientific statement for healthcare professionals from the American Heart Association/American Stroke Association Stroke Council; Council on Cardiovascular Surgery and Anesthesia; Council on Cardiovascular Radiology and Intervention; Council on Cardiovascular Nursing; and the Interdisciplinary Council on Peripheral Vascular Disease. Stroke 2009;40:2276–2293. National Institute for Health and Clinical Excellence. Acute Stroke and TIA Clinical Guidelines. 2008. Available at: www.nice.org.uk. Accessed December 1, 2009. Purroy F, Montaner J, Molina CA, Delgado P, Ribo M, Alvarez-Sabin J. Patterns and predictors of early risk of recurrence after transient ischemic attack with respect to etiologic subtypes. Stroke 2007;38:3225–3229. Cucchiara BL, Messe SR, Taylor RA, et al. Is the ABCD score useful for risk stratification of patients with acute transient ischemic attack? Stroke 2006;37:1710–1714. Fothergill A, Christianson TJ, Brown RD Jr, Rabinstein AA. 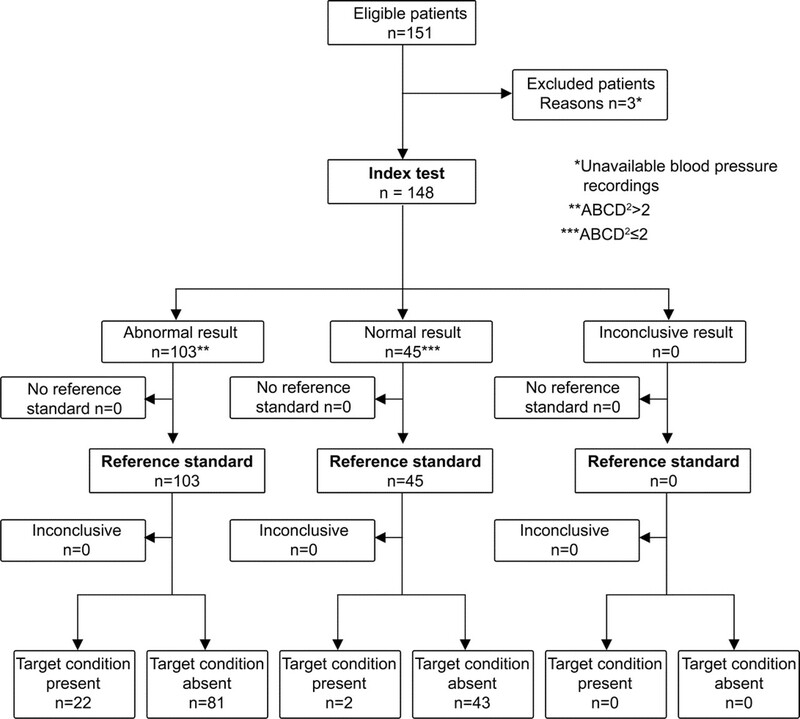 Validation and refinement of the ABCD2 score: a population-based analysis. Stroke 2009;40:2669–2673. Tsivgoulis G, Spengos K, Manta P, et al. Validation of the ABCD score in identifying individuals at high early risk of stroke after a transient ischemic attack: a hospital-based case series study. Stroke 2006;37:2892–2897. Tsivgoulis G, Vassilopoulou S, Spengos K. Potential applicability of ABCD score in triaging TIA patients. Lancet 2007;369:1082. Sciolla R, Melis F; SINPAC Group. Rapid identification of high-risk transient ischemic attacks: prospective validation of the ABCD score. Stroke 2008;39:297–302. Ay H, Arsava EM, Johnston SC, et al. Clinical- and imaging-based prediction of stroke risk after transient ischemic attack: the CIP model. Stroke 2009;40:181–186. Calvet D, Touzé E, Oppenheim C, Turc G, Meder JF, Mas JL. DWI lesions and TIA etiology improve the prediction of stroke after TIA. Stroke 2009;40:187–192. Bray JE, Coughlan K, Bladin C. Can the ABCD Score be dichotomised to identify high-risk patients with transient ischaemic attack in the emergency department? Emerg Med J 2007;24:92–95. Mlynash M, Olivot JM, Tong DC, et al. Yield of combined perfusion and diffusion MR imaging in hemispheric TIA. Neurology 2009;72:1127–1133. Amarenco P, Labreuche J, Lavallée PC, et al. Does ABCD2 score below 4 allow more time to evaluate patients with a transient ischemic attack? Stroke 2009;40:3091–3095. Sheehan O, Kelly LA, Kyne L, et al. Examining the external validity of the ABCD scores in a population based cohort: the North Dublin Stroke Study. Cerebrovasc Dis 2008;25(suppl 2):169. Coutts SB, Eliasziw M, Hill MD, et al; VISION study group. An improved scoring system for identifying patients at high early risk of stroke and functional impairment after an acute transient ischemic attack or minor stroke. Int J Stroke 2008;3:3–10. The World Health Organization MONICA Project (monitoring trends and determinants in cardiovascular disease): a major international collaboration. WHO MONICA Project Principal Investigators. J Clin Epidemiol 1988;41:105–114. Coull AJ, Lovett JK, Rothwell PM; Oxford Vascular Study. Population based study of early risk of stroke after transient ischaemic attack or minor stroke: implications for public education and organisation of services. BMJ 2004;328:326–328. Giles MF, Rothwell PM. Risk of stroke early after transient ischaemic attack: a systematic review and meta-analysis. Lancet Neurol 2007;6:1063–1072. Chandratheva A, Mehta Z, Geraghty OC, Marquardt L, Rothwell PM; Oxford Vascular Study. Population-based study of risk and predictors of stroke in the first few hours after a TIA. Neurology 2009;72:1941–1947. Nguyen-Huynh MN, Johnston SC. Is hospitalization after TIA cost-effective on the basis of treatment with tPA? Neurology 2005;65:1799–1801.